Intel has announced new 8th gen CPUs for the ultrathin and 2-in-1 mobile market. 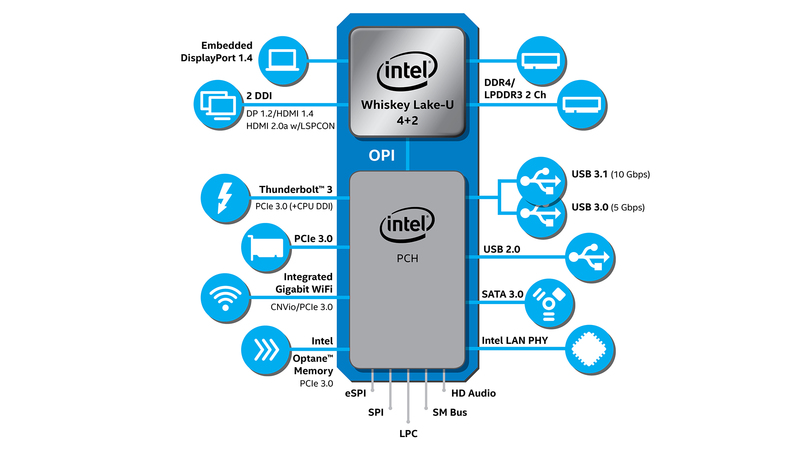 Whiskey Lake is joining the ultra-low power U-series lineup, and Amber Lake is taking on the extremely low-power Y-series. Just in time for OEMs to rebrand for the back-to-school sales rush. Intel hasn’t managed to get its 10nm transistor process node off the ground in anything but incredibly low-performance mobile chips, and isn’t expecting to until this time next year. That means we’ve got a little while longer with the 14nm node – the same one mainstream CPUs have been built upon, in one form or another – since Skylake. The latest 8th gen processors, despite arriving a year after Kaby Lake Refresh chips last year, aren’t taking on the 9th gen nomenclature for a very good reason – they’re all additions to Intel’s mobile lineup, and not next-gen replacements. Realistically, this means that they aren’t that much different to those before them. The only noteworthy differences include: slightly higher boost clocks, inclusion of integrated Gigabit Wifi, and a 14nm PCH. In the U-series Whiskey Lake family, there’s the i7 8565U, i5 8265U, and i3 8145U. These chips will feature up to four cores and eight threads, and fit within a 15W TDP envelope. These will be included in ultrathin laptops, but will leave the super-ultra-extra-thin 2-in-1 market to the Y-series. Speaking of Amber Lake, we’ve got the i7 8500, i5 8200Y, and m3 8100Y entering the line-up, which will all be two-core and four-thread chips. Intel is focusing almost entirely on the improved connectivity this time around, with most of the performance benchmarks touted by Intel comparing these new chips to 22nm Haswell CPUs launched back in 2013, and not to Kaby Lake R chips from last year. Also, because these chips follow on from Kaby Lake Refresh, it doesn’t look like Intel’s applied any of the in-silicon hardware patches necessary to totally mitigate the Spectre, Meltdown, and Foreshadow security bugs made public earlier this year. Expect to see Intel’s latest mobile chips in laptops and 2-in-1s over the next few months. Aside from keeping OEMs happy with a shiny update, these new chips don’t offer a huge amount worth rushing out for.